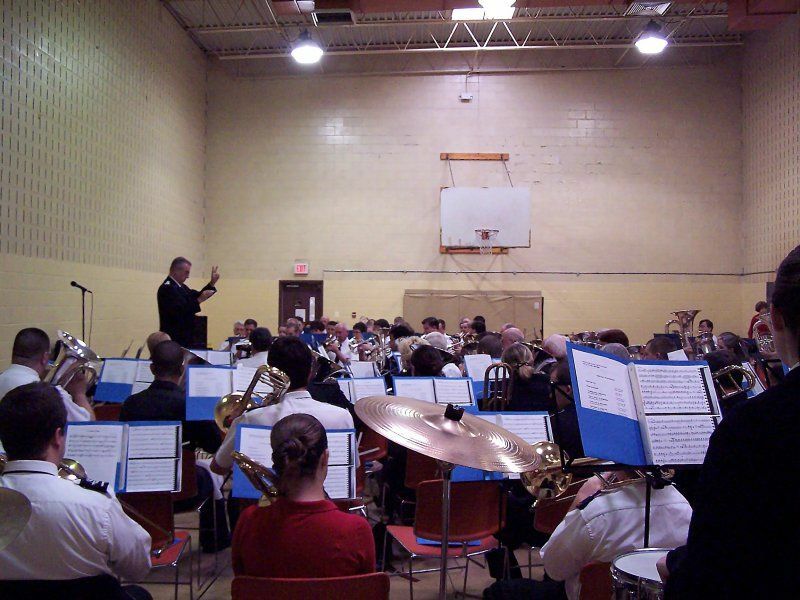 The Montclair Citadel Corps, Montclair, New Jersey, was the venue for a Band Councils held on 9 October 2004. 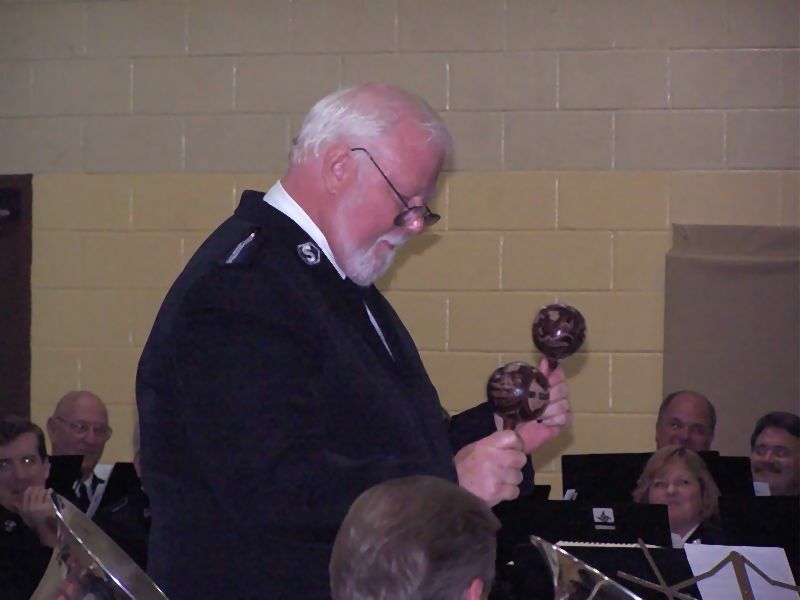 The councils were the centerpiece of a weekend featuring the Norridge Citadel Band, under the direction of Bandmaster Peggy Thomas. 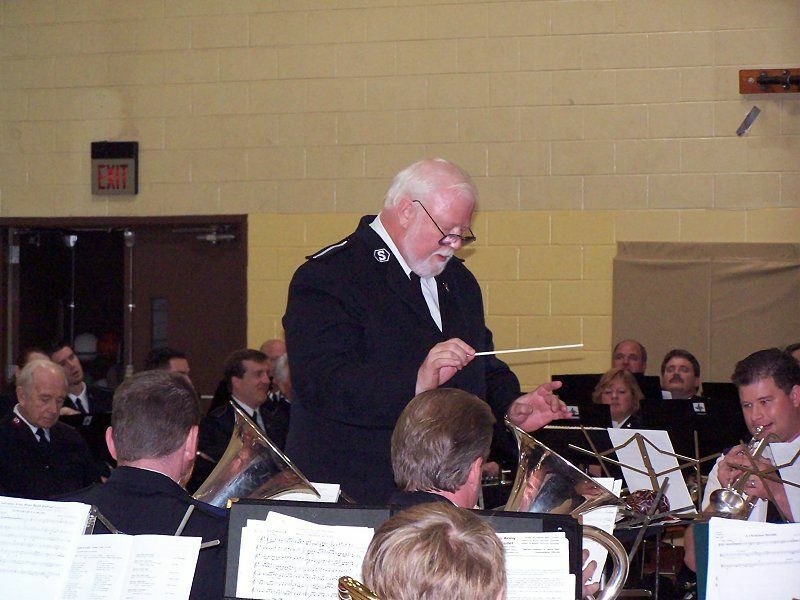 Based near Chicago, Illinois, the Norridge Citadel Band is known as one of the best Salvation Army corps bands in the United States. In addition to the Saturday events, the weekend also included a concert, held at the Clinton Presbyterian Church on Friday evening, and Sunday worship services at Montclair Citadel. 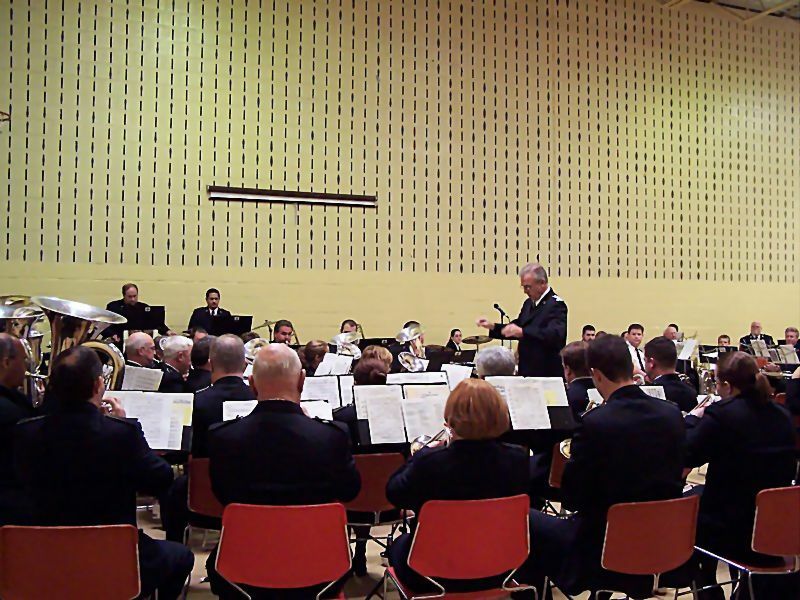 The Friday evening concert was for the benefit of the Salvation Army’s Camp Tecumseh. Other groups participating in the Band Councils included the Asbury Park Corps Band, Asbury Park, New Jersey (Bandmaster David R. Hulteen), the Spring Valley Corps Band, Spring Valley, New York (Bandmaster Dorothy Gates) and the host ensemble, the Montclair Citadel Band (Bandmaster Charles L. Baker). Saturday’s events began with a massed band session, set up in the Montclair Citadel gymnasium. 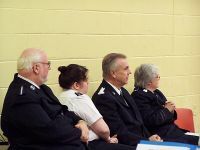 Over 80 musicians took part, including members of all four participating bands and other Salvation Army musicians attending the Councils. After warming up with a few selections from the Band Tune Book, the massed ensemble read through the latest edition of the American Band Journal and two new selections in the Triumphonic Collection, both published by the USA Eastern Territory Music Department. The reading session was chaired by Aaron Vanderweele, director of publications for the Music Department, who is a member of the Montclair Citadel Band. 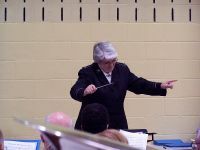 Several of the bandmasters in attendance took turns conducting the massed band, including Charles Baker, Peggy Thomas and Dorothy Gates. Bandmaster Gates, who is the Music Editor for the USA Eastern Territory, conducted two of her own works, Feliz Navidad and A Christmas Fanfare. The concluding item of the session was conducted by Bandmaster Ronald Waiksnoris, Territorial Music Secretary and Bandmaster of the New York Staff Band, also a member of the Montclair Citadel Band. 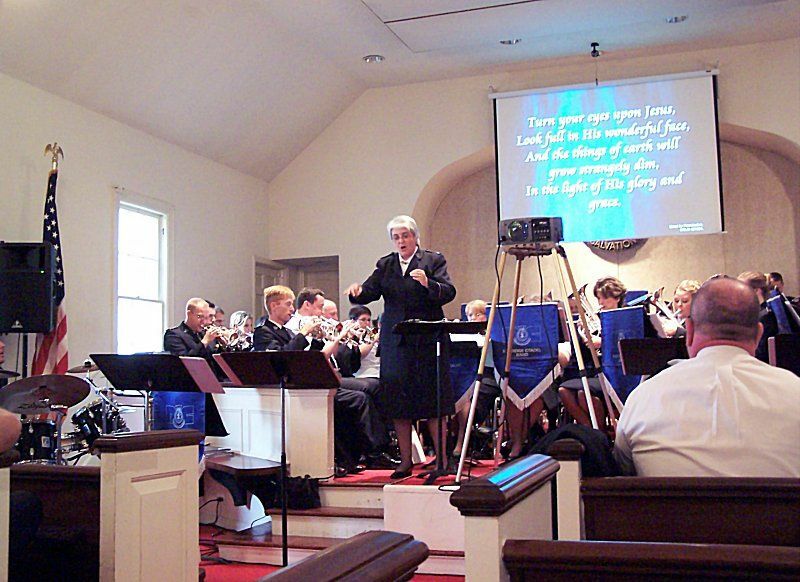 Following the opening session, the scene shifted to the Montclair Citadel chapel, where Bandmaster Thomas presented a workshop showing ways of integrating contemporary music, traditional brass band instrumentation, vocals, dramatic presentations, and multimedia into a unified worship experience. The workshop focused on the need for intentional planning and cooperation among the various groups involved. 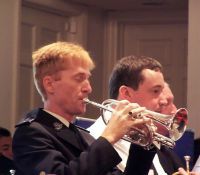 Several examples were given, including a demonstration of the use of the Hallelujah Choruses, a worship series originated by Bandmaster Thomas at Norridge Citadel and published by the USA Central Territory. 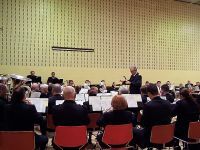 Following a break for lunch, the Councils reconvened in the gymnasium for a Cavalcade of Bands, featuring the Asbury Park, Spring Valley and Montclair bands. This program was chaired by noted Salvationist composer and conductor Lt.-Col. Norman Bearcroft, who delighted the audience with his "war-stories" in between selections. 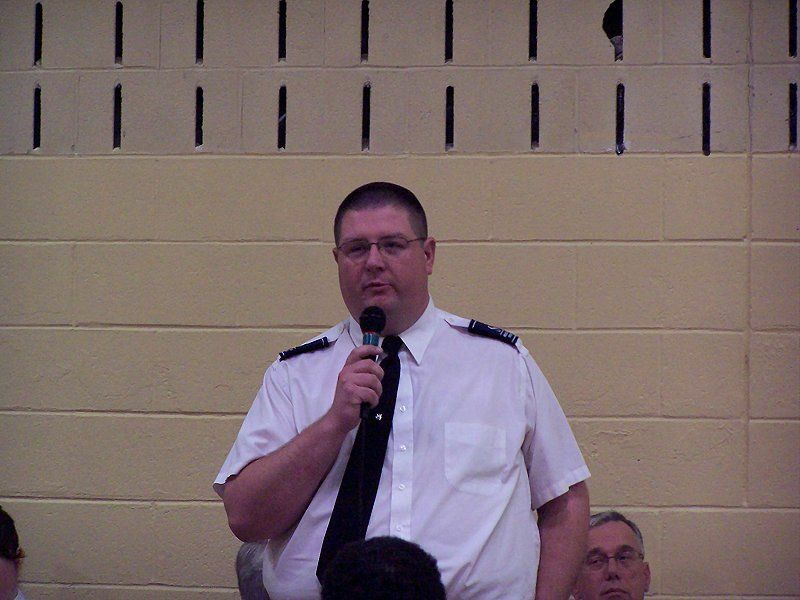 The program opened with a congregation song, prayer, and introductions by the host Bandmaster, Charles Baker. The Asbury Park Corps Band got the program started with James Curnow’s prelude Come Thou Almighty King, followed by the Spring Valley Corps Band presentation of an old Festival Series selection, Great and Glorious (George Marshall). 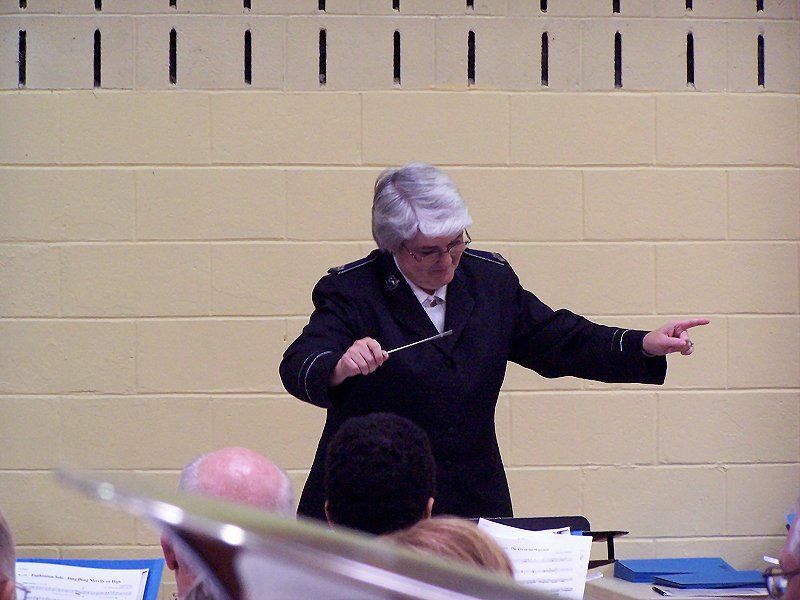 Up next was the Montclair Citadel Band, with Leslie Condon’s bright festival march Celebration. Danish Salvationist Erik Silfverberg is noted for innovative arrangements for smaller ensembles, and Tomado de la Mano, a Latin-flavored arrangement, is no exception. A high point of the Asbury Park band’s performance was Bandmaster David Hulteen’s foray into the world of percussion, providing assistance on whistle and maracas from his position in front of the band. This was followed by the first solo offering of the afternoon, cornetist Derek Lance playing Glory to His Name (Eric Ball), accompanied by Bandmaster Dorothy Gates and the Spring Valley Corps Band. The Montclair Citadel band then presented Philip Wilby’s sensitive arrangement The Day Thou Gavest. The last portion of the program was kicked off by the Asbury Park Corps Band, playing Stephen Bulla’a march Joyous Celebration. The second solo item of the afternoon was presented by Montclair Citadel Band. 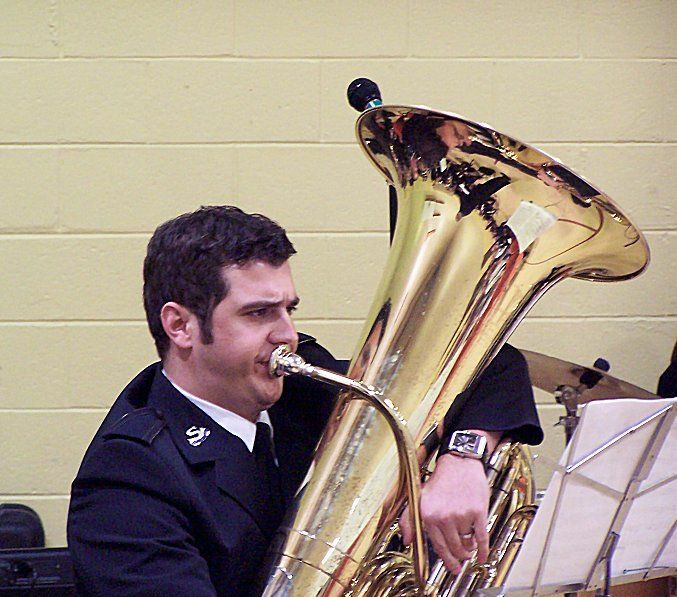 This was the first performance of a new work for solo tuba by Ralph Pearce, entitled Transformations, written for and played by the composer’s son-in-law, Andrew Baker. Although the music had only been sent two weeks before, the performance was enjoyable and the piece should be a welcome addition to the small number of works for solo tuba. Spring Valley Corps Band concluded the Cavalcade of Bands with the fifth movement of Cry of the Celts (Ronan Hardison, arr. Peter Graham), featuring the American folk tune "Simple Gifts", also known as "Lord of the Dance". The conclusion of the Band Councils was a Festival of Music by the Norridge Citadel Band, held in the Montclair Citadel chapel. 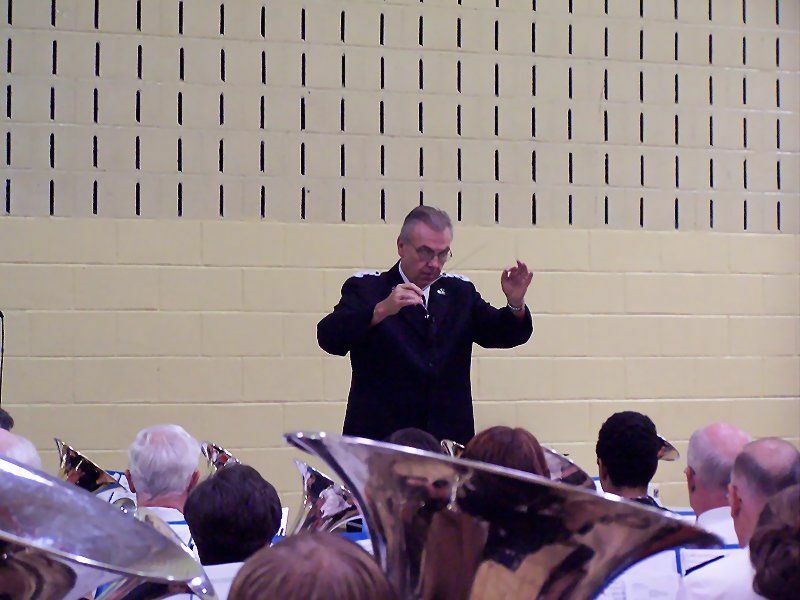 The festival began with a “section feature”, Brass Presentation (Bertrand Moren), which featured the various sections of the band standing when they were carrying the arrangement. Principal cornet Randy Cox then played Doug Court’s Latin-influenced solo Standing on the Promises, showing his flexibility by beginning on flügelhorn and completing the solo on cornet. The trombone section was next to demonstrate their skills, as the band performed Concertante for Trombones (Stephen Bulla). The major work of the first half of the program was Lorne Barry’s extended treatment Credo, largely based on “’Tis so sweet to trust in Jesus”. 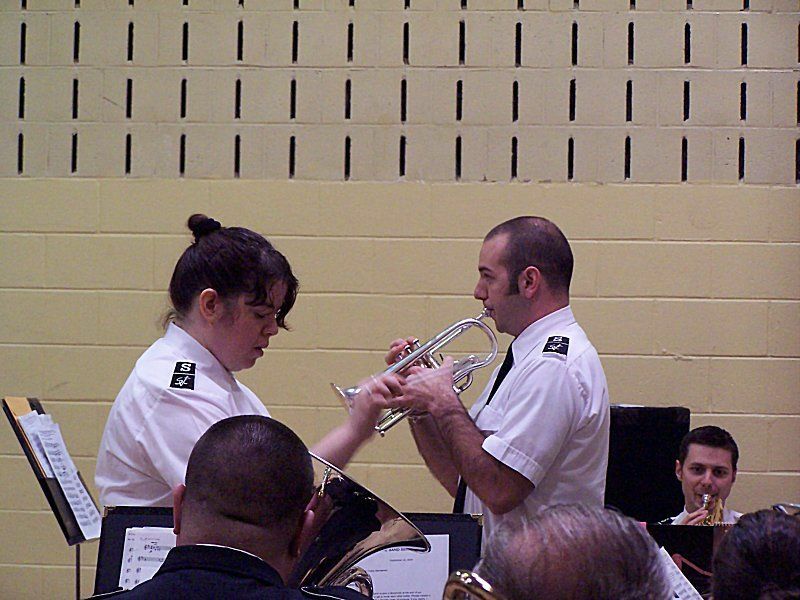 Another solo item, Swingtime Religion (Barrie Gott), in a big-band style, was performed by cornet soloist Ben Kinzie, conducted by the Deputy Bandmaster, Randy Cox. The final item of the first half was a modern transcription of a classic work, Bach’s Toccata in D minor, arranged in a thrilling contemporary style by Ray Farr. Following the intermission, the band brought the audience back in with a Caribbean-flavored march entitled Island Dreams, written by Marty Thomas, a member of the Norridge Citadel percussion section. The remainder of the second half of the festival was an extended, unified presentation, Come Into Our World, featuring all components of the group, including the worship band, vocalists, multimedia presentations and the brass band. The complete Gospel story was told, from the Creation, birth of Jesus, His ministry, the Crucifixion and Resurrection, ending with an invitation to salvation. Spoken-word sections were interspersed with the musical items, building the presentation in a moving and inspirational crescendo. Vocal items featured during Come Into Our World included Captain Alex Norton, singing God of Wonders (Marc Byrd and Steve Hindalong, arr. Rory Noland), pianist Peter McBride playing and singing Welcome to Our World (Chris Rice), and the entire vocal group (Marty Thomas, Randy Cox, Captain Alex Norton, Heidi Strand, Courtney Strand, and Tanya Hedberg) concluding the concert with Worthy Is the Lamb (Darlene Zschech). The band contributed Who is He? (Richard Phillips), Amazing Love (William Himes), and Peter Graham’s masterful arrangement Renaissance, with its concluding statement of May Jesus Christ Be Praised!. This article was posted in News and tagged Aaron VanderWeele, Alex Norton, Andrew Baker, Asbury Park Corps Band, Ben Kinzie, Charles Baker, clinic, concert, Courtney Strand, David Hulteen, Derek Lance, Dorothy Gates, Heidi Strand, Marty Thomas, Montclair, Montclair Citadel, Montclair Citadel Band, music councils, New Jersey, New York Staff Band, Norridge Citadel Band, Peggy Thomas, Randy Cox, Ronald Waiksnoris, Spring Valley Corps Band, Tanya Hedberg on 16 October 2004 . 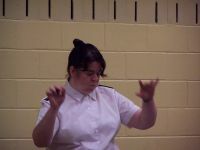 I realy admire Montclair Citadel Corps band. I am an Assist. Bm in kenya Quarryroad band.Wish to be ijn touch with u people. Please can email me.